Thick volume including protocols of deliberations of the Moetzet HaAm meetings and Provisional State Council meetings from May 1948 through September 1948. Protocols of the rich legislation and extensive deliberation of the character of the state being established and decisions and deliberations on pressing emergency issues [Ben-Gurion: "Gentlemen, the Council and the People's Administration have been assigned two functions: security and establishment of the state ..."]. 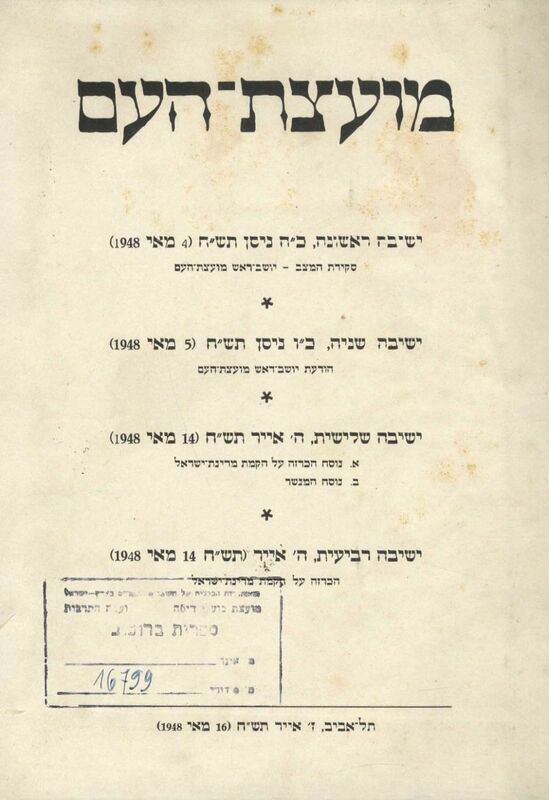 Among the topics deliberated: "Ordinance of Government and Law" (the first legislation for the State of Israel), "Emergency Regulations," extensive discussions of the Altelena affair [Ben-Gurion: "Gentlemen, the Council has been called today to commemorate the tragic and serious event which befell us - the attempted assassination by the Irgun, known as "Etze"l"], the ordinance of the symbol of the State of Israel, the ordinance of the constituent assembly, and more. The provisional governments were established between May 1948 and February 1949, and served as a link in the transition between the Mandate government and the Israeli Knesset.